After a lot of research, On The Rocks in Imerovigli is where we chose to stay. Honestly, this place is next level and despite all the wonderful things to do and see in Santorini, we were happy to camp at this boutique hotel and only leave the incredible pool for food! 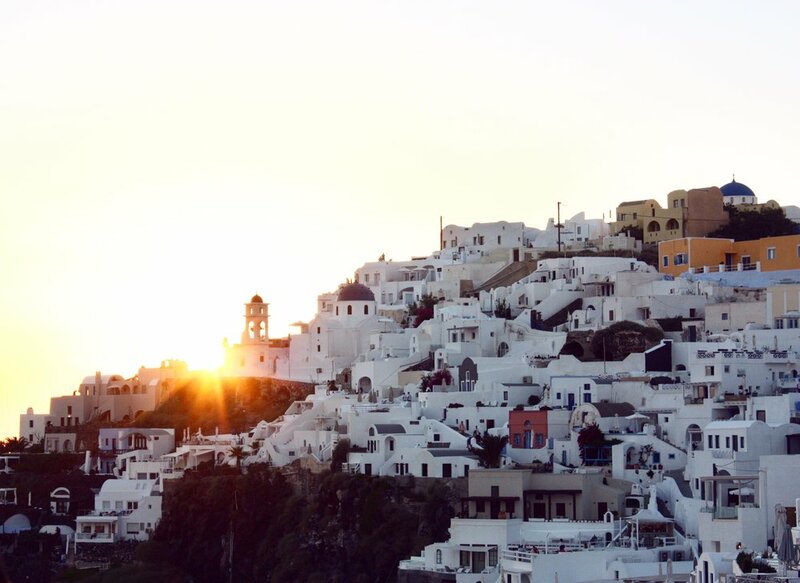 Imerovigli is a fantastic part of Santorini- it is a lovely 20 minute walk to Fira along the side of the island overlooking the caldera and a 10-15 minute taxi ride to Oia so it's a nice and central place to stay. If you're looking for a quitter part of the island where you can relax, enjoy the pool at your luxury hotel and eat incredible food- this is where to stay. On The Rocks is only a short walk down the side of the island from the street and once you arrive at the hotel you really don't expect to see the uninterrupted view of the caldera, but you do and it's unforgettable. The resort are the perfect hues of white, grey and blue. You can wake up every morning to a delicious home cooked breakfast on your balcony which overlooks the caldera- there is no better way to start your day! You can then spend the rest of the day poolside (still mesmerised by that view), indulge in the impeccable service from the staff and order cocktails and Greek food from room service. There is really no reason to leave! The other fantastic part about On The Rocks is that it's surrounded by some of the best food I've eaten in Europe (big call, I know)! In less then five minutes, you can take a picturesque stroll to restaurants that offer an uninterrupted view of the famous sunsets that will blow your mind! On The Rocks also has a beautiful spa where you can have some much needed TLC. The spa room is dug into the side of the cliff face which offers a romantic and unique experience. This place is a bit of a splurge, but you will not regret it. It will be a vacation that you'll never forget!